The Holderness Road trolleybus route conversion was about to get underway, but the outbreak of World War 2, intervened. Much of the overhead equipment was already on hand or on order at this point, added to which the tramway was getting in need of replacement. Hull Corporation therefore applied for Parliamentary permission to convert the route to trolleybus operation. Permission was forthcoming and the route was duly converted. To operate the service, which was given the route numbers 64 and 64A. The latter was a short working to East Park, used mainly to turn duplicates off the main route which terminated at the Ings Road junction. To operate the service twenty Leyland TB7CN chassis were purchased and these were bodied by East Lancashire Coachbuilders, a company new to Hull Corporation. Initially the seating was H28/26R, but was later up-seated to H31/29R. 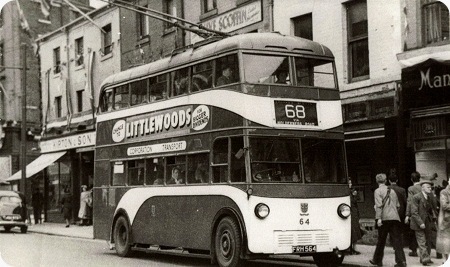 Bus number 64 (FRH 564) is shown operating along Holderness Road. The photograph may have been taken in Coronation year, 1953, if the flags and bunting on the buildings are anything to go by. Just curious about this TB7CN – TB for Trolleybus, 7 for the 7th model possible the numbers were linked to the Titan TD numbers, but what did the CN stand for? You have me on this one, all I can say is that this type was on a fleet list obtained from Geoff O’Connell, whose knowledge of KHCT was second to none. He was the Assistant GM at the time I knew him. I believe that the TB series numbers were linked to the Titan series, with regard to chassis improvements, but I’ve not seen any confirmation of this. The batch was just designated TB7 – I have copies of the specification and tender forms from Leyland. All twenty were built in 1939 being delivered in the late Summer of 1939. Nos 47/8/51/2 entered service on 31 August 1939. The Corporation already had permission to convert the route but, owing to the War, no Ministry of Transport inspection would be made it being up to the General Manager to authorise it. The Transport Committee being uncertain about the war situation at first declined to convert the route (originally scheduled for September 1939) and not until February 1940 did it agree. Geoff O’Connell was never the Assistant GM but was in the Traffic Office. For more details see my book "Kingston upon Hull Trolleybuses" published by Trolleybooks in 1996. The first trolleybus route in Hull commenced in June, 1937. It replaced the tram route SWC, but not directly, as a short lived motorbus service, numbered 12 ran in the interval between the end of the trams and the start of the trolleybuses. The route ran along Spring Bank, Spring Bank West and Chanterlands Avenue. A new route number series for trolleybuses was instituted at this time, the first number being 61, along with a short working to Goddard Avenue turning circle, which was numbered 61A. This latter was renumbered to 65 in 1943. To start the service, along with the Newland Avenue (62, 62A) routes, 26 trolleybus chassis were purchased from Leyland. These were of the TB2 type, equivalent to the Titan TD2 chassis. Numbers were 1 to 26, which commenced a separate series from the motorbuses. Registrations were CRH 925-50. The trolleybuses carried the newly introduced streamline livery. During the war, in 1941, due to service cuts four trolleybuses (1 to 4) were loaned to Pontypridd UDC, being returned the following year. No 3 is shown at the Old Bridge in Pontypridd, seeming to be causing interest to the gentleman on the bridge! Although still carrying the streamline livery, the white has been over painted in a light blue colour, making the livery a two-tone blue. Of note is the pre-war "HULL" on the upper deck side panels, and "Corporation Transport" being on white lozenges. I have seen this batch also quoted as being of the TB4 type, but if anyone can provide a definitive answer I would be grateful. Chassis numbers were in the series 12280 to 12306. I wonder who over-painted the white to light blue – Hull or Pontypridd? Interesting photo – not many wartime photos exist, especially of those who went to foreign climes for a while! Headlamps restricted and white painting around the front edge, but no window netting. Maybe they didn’t feel there was a strong likelihood of air raids in that area. Pontypridd must have had an acute shortage of buses/trolleybuses in the war, for Portsmouth Corporation sent several trolleybuses there, too. Imagine having to tow and steer these vehicles such long distances! 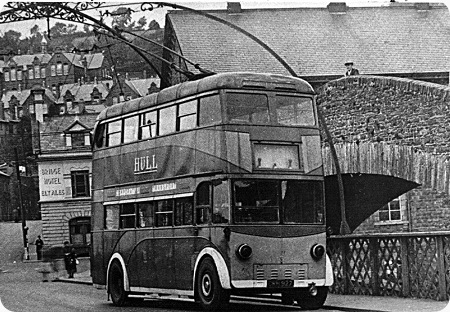 I believe that Hull was responsible for the over-painting, as native buses and trolleybuses were also treated similarly. I cant say about window netting, as I’m not quite that old! Hull certainly did have some air-raids during the war, and lost 35% of the bus fleet in May, 1941. No trolleybuses were affected, however. The over painting was carried out by the Transport Department over a period of ten days in late May 1941. All trolleybuses were parked along main roads at night to prevent their loss if a garage was hit by bombs but the white could be seen from the air and the undertaking was asked to do it, Geoff O’Connell (whose father was an inspector) told me that he remembered seeing TB7 no 52 being all blue at the front and offside but with normal livery on the other! Hi Malcolm, can we can confirm that these trolleys were actually TB4 and not TB2? I have seen them quoted with both model types but the date would make TB4 more likely. I have a photocopy sheet from Geoff, which shows the layout of the original Black on white blinds, with routes 61, 61A, 62, 62A, 62B, 62C, 63, 63A, 64, 64A, 65 and 66. Of course the 65 and 66 were not operated as such, but were the 62B and 62C ever operated? The ‘A’ route numbers are shown as being blanked out along with 65 and 66. You mention the Anlaby Road route as being 99, but I have no record of this, was it actually used in service? Do not know if the following will help but the dates below are for when the TDs first appeared. The reference to service 99 was a typing error – it was 69. Leylands 1 to 26 were designated TD4 in the original tender from Leyland Motors in July 1936 and this was quoted in the minutes but was subsequently altered to TB4. The 62B and 62C were never operated but no reason for doing so has ever come to light although a difference in headways might have contributed – there were more trolleybuses per hour on Beverley Road than on Newland Avenue. I’m sure most people who have posted on this subject already know this but there are some really fantastic short videos on YouTube concerning Hull trolleys and motor buses from before WW2 to the present day. It seems Hull has been more fortunate than many places in having such a wonderful pictorial transport record! Having lived in Hull from 1946 to 1963, I can clarify the route number situation. 66 was the shortened version of 62 terminating at Pearson’s Park. All of the above originally ran on the pre-war Leyland Buses, but were replaced in 1950 by the forward control dual entrance and dual staircase Sunbeams – which were supposed to have counters on the stairs with the forward staircase for ascending and the mid-bus staircase for descending- this was not a success. 68 was the shortened version up to East Park – peak only. (a shortened version (170 or 270) ran but only after the end of the trolleybus system. All 69’s and 70’s used 1948 vehicles which (from memory) were B.E.T. (which was a joint A.E.C./Leyland venture) for the duration of the trolleybus system. The joint Leyland and AEC was actually BUT. They also supplied engines for early railway Diesel Multiple Units. The sight of Hull trolleys in Pontypridd must have confused any potential German Spies!!!! Chris Hebbron is certainly right in an early comment that Pontypridd needed extra vehicles during the war. However the Portsmouth and Hull trolley-buses were probably not operated concurrently. The main caption above mentions the Hull quartet on loan to Pontypridd in 1941 to 1942. The Portsmouth quartet went to Wales in August 1942, so presumably were replacements for the Hull ones returning north. Pontypridd gained an extra six seats per vehicle. But they lost out on standardisation, as two Portsmouth vehicles were AEC 663T, and two were Sunbeam MS3s. Two had MCCW, and two EEC bodies, one on each make of chassis. Also two had EEC motors, but one regen the other augmented field, the other two having BTH motors, one regen, the other regulated field. Such was Portsmouth’s desire to experiment! None of them had traction batteries, and had been in storage at Portsmouth since c.1940 so that they wouldn’t block the streets in the event of power cuts due to bombings etc. Three of them stayed at Pontypridd until November 1945, the fourth returning in August 1946. 70 Dairycoates – well short (over a mile ) of the city boundary. The twenty Leyland TB7s (nos 47-66) were delivered in the Summer of 1939 – Nos 47/48/51/52 were licensed from 1 August 1939. By December 1960 only seven were left (48/54/55/61/63/64/66) and several Crossley TDD4s were sent to Holderness Road to maintain the 64/68 service. All seven were withdrawn on 28 January 1961 when service 70 was withdrawn. KHCT never operated BUT trolleybuses – the 1948 vehicles were Sunbeam F4 with Roe H60R bodies (8 feet wide). All ten entered service on 1 June 1948 but were later split between the 69 and 70. The dual door trolleybuses were Sunbeam MFsBs with Roe H54D bodies. No. 101 arrived in later 1952 whilst the further fifteen entered service from November 1954 to May 1955. they were intended for one-man operation using tokens and tickets – no cash and Mr Pulfrey, the GM, wanted the 63 to be the trial route but due to Union opposition they never ran in that form. No. 116 was fitted with an electronic counter on both stairs but it was not successful. No. 116 also had a Grant farebox fitted but never ran in service as such. They gained the nick name "Coronations" as no. 101 entered service in January 1953. The service 67 was the renumbered 63A which ran to Chanterlands Avenue North via Beverley Road and Cottingham Road at times during the war and for a short time thereafter. The Original 63A was intended for short workings to Haworth Arms. KHCT wanted a roundabout here so that alternate vehicles on Beverley Road could turn here but nothing came of this partly due to the start of the war. The 61/62 were the preserve of Leyland TB4s pre-war whilst the Crossleys ran the 63 – they were kept apart in Cottingham Road garage! Nos 1 to 4 were recalled from Pontypridd to permit the Anlaby Road tram route to be converted to trolleybus operation. Full details of the fleet list were posted on this site by Keith Easton some time ago and can be viewed at this link.